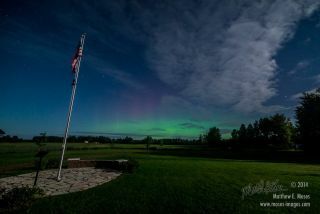 Astrophotographer Matthew Moses caught a subtle aurora in Munger, Minnesota, just outside the Duluth area, on Sept. 11, 2014 just as the first of two solar storms was reaching Earth. Skywatchers on the ground are already catching sight of some amazing looking auroras produced by solar material blown out from the sun during two major eruptions this week. Two photos sent in by observers in the United States show curtains of green lights dancing above Earth's surface. Even astronauts on the International Space Station are keeping watch for new auroras. Early today, NASA astronaut Reid Wiseman on the station posted a photo on Twitter of a shimmering green aurora as seen from his post on the orbiting lab. Wiseman posts photos of life in space under the name: @Astro_Reid. He also recorded a short Vine video of himself as he opened a protective window cover on the station's Cupola observation station. "Beautiful #aurora are coming back. A welcome return indeed!" Wiseman wrote on Twitter. Auroras are produced when charged particles from the sun interact with particles in Earth's atmosphere, creating the glowing lights people in northern latitudes can sometimes see in a clear sky. The active sunspot called AR2158 shot off a M4.6 moderate solar flare on Monday, with a very powerful X1.6-class flare following close behind on Wednesday. Both flares had associated coronal mass ejections — hot bursts of plasma sometimes sent out into the solar system by the sun during a solar flare — that are now potentially producing the auroras on Earth. College senior Tyler Baldino sent in this amazing photo of an aurora and the stars of the Big Dipper as seen from Canton, New York, just outside of St. Lawrence University, about 20 miles south of the St. Lawrence River. The image was taken on Sept. 12, 2014, as the first of two solar storms was reaching Earth. The double CME could supercharge the auroras, according to space weather experts. The solar storm may make for amazing aurora shows on Earth for people as far south as the northern United States, weather permitting. The solar storm probably won't pose much of a threat to spacecraft in orbit and infrastructure on the planet. It's possible that the CMEs might cause some issues for GPS navigation, radio and power grids in the northern United States, but it shouldn't be an extreme problem, according to NOAA's Space Weather Prediction Center Director Thomas Berger. Editor's Note: If you capture an amazing photo of the northern lights this weekend and would like to share the images with Space.com, you can send photos and comments in to managing editor Tariq Malik at spacephotos@space.com.